The sun was slowly sliding down towards the horizon as a constant drizzle of rain continued to fall in the Black Canyon of the Gunnison National Park. Perched on an outcropping of rock overlooking the river far below I was hoping that the sun would break through the cloud cover for just a moment. The cloud cover was just too much, and I had almost given up as the sun dropped below the horizon, when the rain stopped and the clouds began to change. First it was oranges and yellows, then reds, and finally a deep purple lit the underside of the clouds. The rain had brought out the whites and pinks of the canyon walls, and now the sun was painting the clouds from below the horizon! 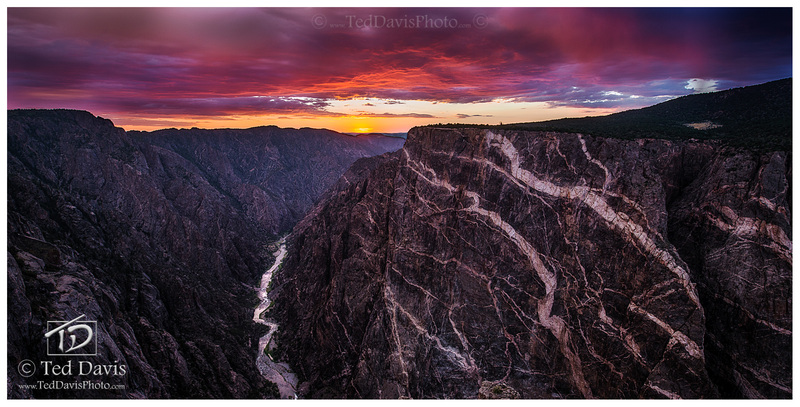 From a slow rain drizzle to a beautiful glow, the Black Canyon of the Gunnison was the canvas of Mother Nature's beauty on this late summer evening. Photo © copyright by Ted Davis.